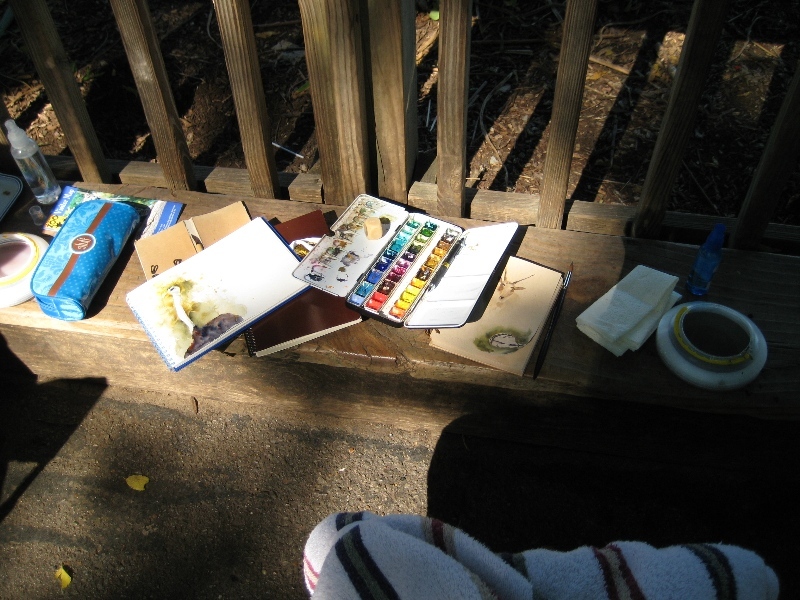 Well, more than a month later I’m getting around to posting about our painting day at the zoo. 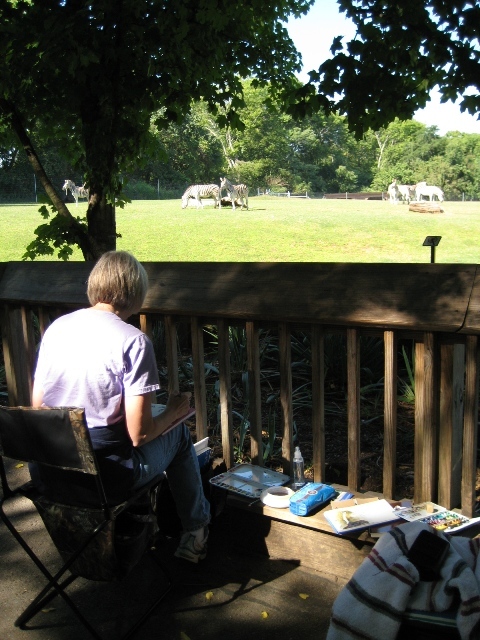 Monica is a friend I met in my painting class I taught here in Hendersonville – she’s a great artist. I was wanting to go to the zoo to paint and sketch but was a little intimidated to go by myself, so I e-mailed Monica to see if she wanted to go with me. 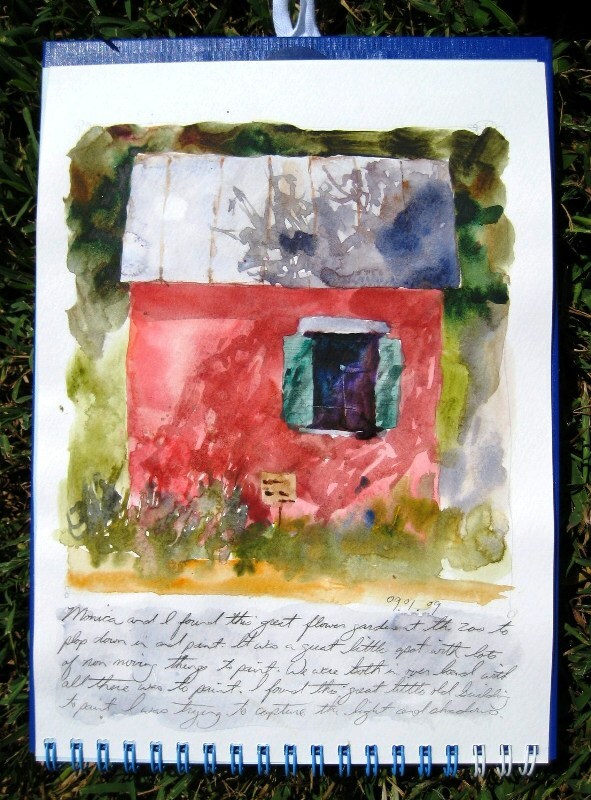 She said yes even though she had not done much plein air painting (that just means you get outside and paint – not sure why it has to have a fancy name) but she’d love to give it a try. We had a blast! We seriously could not have had better weather that day! The first place we set-up “camp” was by the zebra and some other gazelle type thing – oh yea, there was an ostrich in there too. 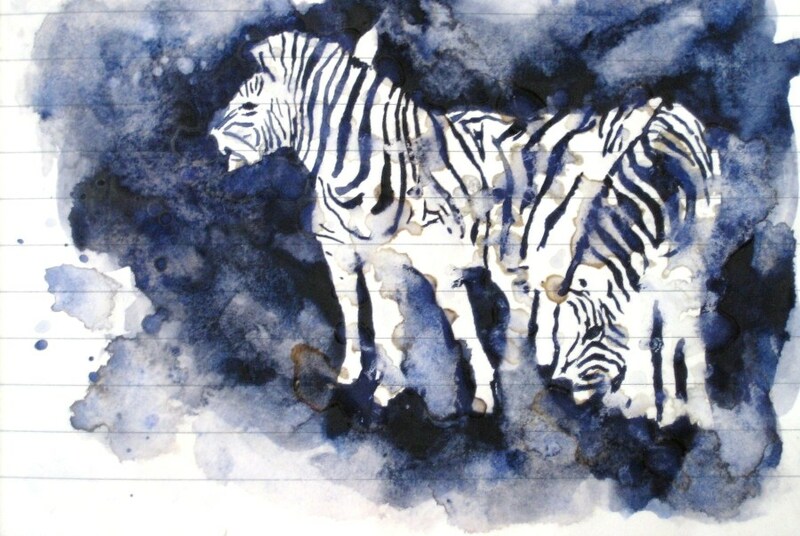 Painting the zebra was not as easy as we thought – they moved like crazy. Monica did a much better job at it than I did. 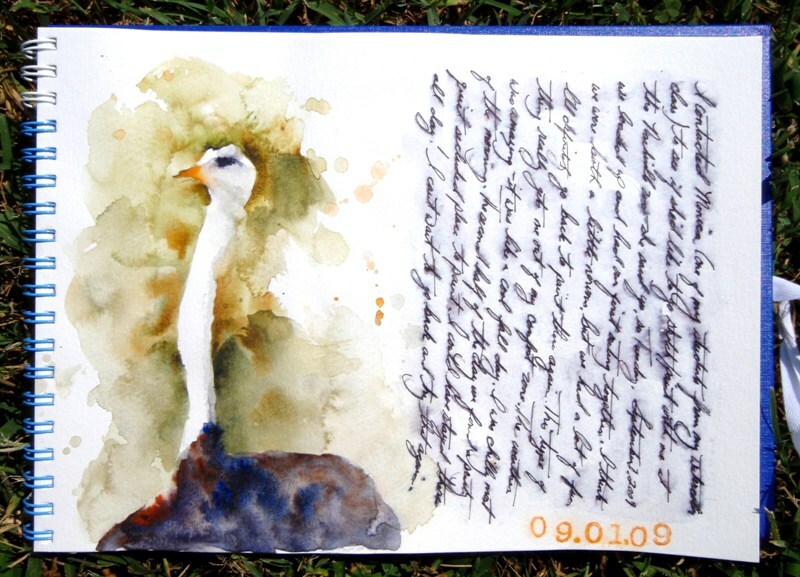 I got frustrated very quickly and moved to some non-moving things – first was a grouping of rocks (not posted here) then I stepped it up and painted the content and still ostrich. I found out later why it was so content to pose for me – it had a lame leg – poor guy! 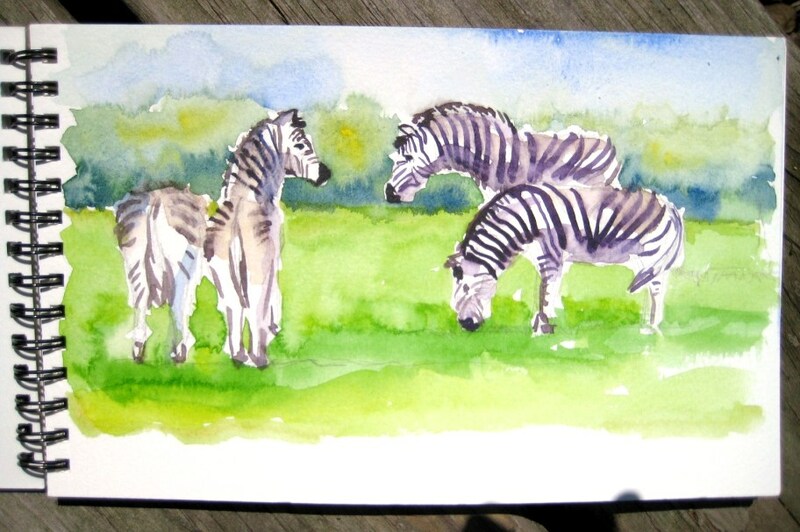 I did give the zebra another try once I was home – I did a quick sketch from a picture I had taken. I used one color through the sketch – I wanted to just paint the background and stripes to see if I could get a suggestion of zebra – I think it worked for such a quick sketch. After painting there for a little while we took a bathroom break, stretched, and moved to an interesting part of the zoo. 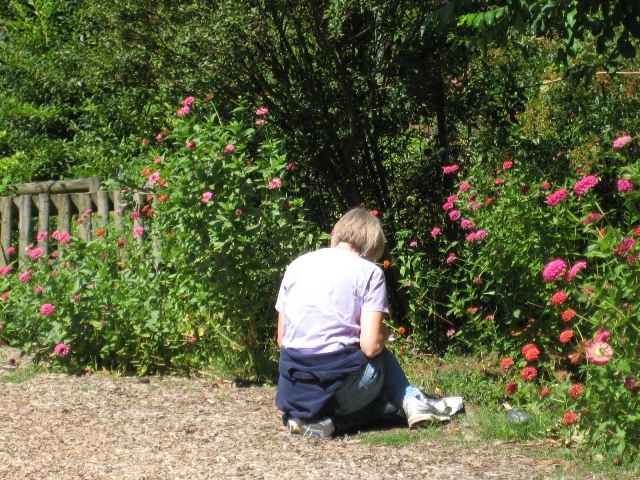 It was an area that had beautiful stuff to paint that didn’t move – old buildings and a flower garden (you can see Monica plopped right down among the flowers and started painting). It was a nice way to finish the day. I’ll definitely go back there – actually, I was going to go yesterday but realized school was out and that it could be a little crowded. Below are a couple other sketches I did while there. We had several people stop and look at our paintings – everyone was really nice. The experience helped us get over our stage fright of painting around people. You can click on any of the pictures to see them larger. Sandi, I followed you here from Different Strokes and really am enjoying your blog. Of course, I have only read through this post and looked at the photos from the last two posts, but still! Looks like my kind of place! I am loving your sketchbook! I need to make use of my own. Looks just so awesome! Hey Sherry, thanks for stopping by and for the very kind comments about my blog and sketchbook! I hope you enjoy looking around! The sketchbook is a great place to practice and record what’s going on in your life. It’s also great if you only have a little bit of time to paint and don’t have the time or feel like doing a “master piece”. Hope you’ll come back to visit!